From new parents to nurseries, everyone can benefit from early years learning framework in one way or another. There have been studies published which show that the first years of children’s lives are the best years for learning. Without overcomplicating things, given that their brains aren’t fully developed it is easier for them to retain knowledge. When it comes to childcare and all things related, we’re the professionals. We provide various expos around the country which include a range of different workshops for those attending to check out and if this is something which you’d like to find more out about, either get in touch with us or continue reading. Firstly, if you’re interested in coming to one of our expos, no problem. You can attend for free by simply registering for tickets here on our website. We invite hundreds of professionals who have devoted their life to childcare to each of our expos; some regular, some who join us on occasion. Many of these professionals choose to run some of our workshops and share their knowledge about early years learning framework. 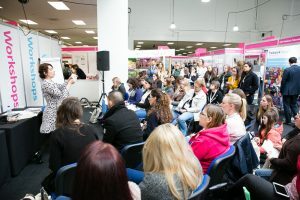 All in all, there are a variety of people who join our expos, and the chances are if you have a question about early years learning or childcare, then they’ll have the answer for you. Throughout the rest of 2017, we have two more expos planned. We will be in Manchester on the 16th and 17th of June, and will be in the Midlands on the 29th and 30th of September. We have already had our first successful expo at the beginning of March and plan to continue running them as scheduled. For more information on our upcoming Manchester Expo, click here to find out where we’ll be and how you can get your free tickets today. When it comes to our expos, our goal is to help you learn as much as possible about early years learning framework so that when you leave, you felt like you’ve benefited from our workshops. We understand that we have some people who regularly attend our expos and so we do our best to make each expo different so that everyone can get something out of them. If you’re interested in finding out more about us or you’re looking for some extra reading material, we’ve got just the thing. We regularly publish a newsletter which we send out to everyone on our mailing list which includes a wide range of information regarding childcare and early years learning framework. Every newsletter that we publish is different, and so you can always expect to learn something new. Just click on the “Subscribe to Newsletter” button at the top of our website, enter the details required, and you’ll start to receive regular newsletters from us! Do you have some questions regarding our expos or would like to find out more information about how they can help you with early years learning framework? If so, feel free to get in touch with us today. You can give us a call on 01425 838393 or send us an email at info@childcareexpo.co.uk. We strive to help people as much as possible when it comes to childcare, and by attending our expo, you are helping us to make that a possibility.